2. 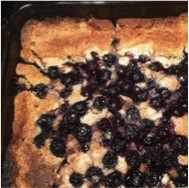 Get a baking dish, and mix the blueberries, 3 tablespoons of sugar, and maybe half a glass of orange juice. 3. In a small bowl, mix nearly a full cup of flour, a tiny bit of baking powder, and salt. 4. In a medium bowl, use a beater to whip the butter, add 1/2 cup sugar to make it light and fluffy. 5. Beat in egg and vanilla extract. “There’s nothing better than fresh eggs. I got chickens for my birthday two years ago. They’re stupid hens but they have good eggs. Me: How are they stupid, Dotti? 6. Add the flour mixture, stirring until ingredients are combined. This should form like a batter. 8. Bake in the oven for 35 to 40 minutes, until topping is golden brown and filling is bubbling.